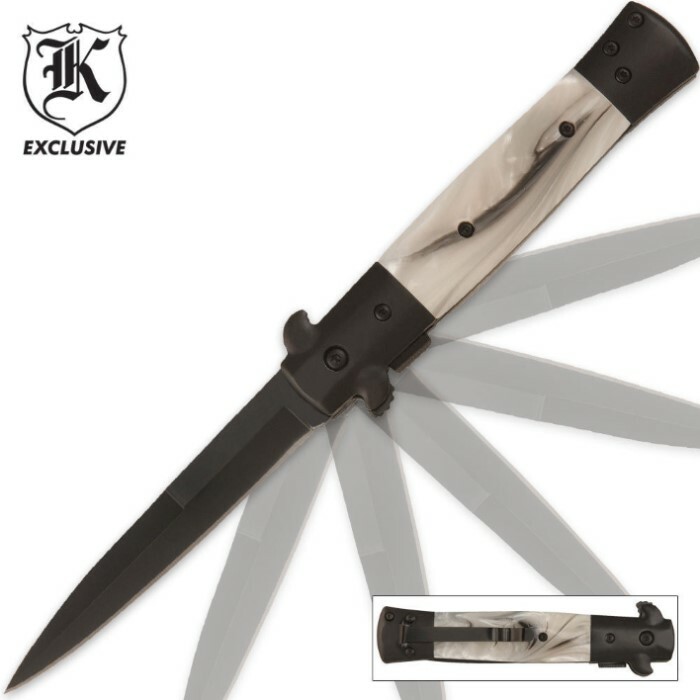 White Pearl Handle Stiletto | BUDK.com - Knives & Swords At The Lowest Prices! Reminiscent of the knives of the 1950s gangsters, this stiletto is the perfect gentleman's knife! The lightning-fast assisted opening mechanism will leave you astonished. This is a really solid knife, there's nothing terribly wrong with it. You might have to tighten some of the screws, but other than that it's nice. The blade comes pretty sharp, but not razor sharp, could be better. All in all, for 7 dollars, don't expect a 200 dollar knife, but it surpasses its cheap price of 7 dollars. Worth the buy. I bought this knife sometime last year and loved it so much that I have bought another 3 more for my sons since then. Feels great in the hand, nice and sharp out of the box, great piercing point and strong. Will probably purchase a few more of these for a few other friends. 2 thumbs up Krieger ! Smooth, fast, Wicked sharp! Very comfy in hand and carry. Great buy! Is NOT easy to open. Big fingers can not really get to button. Had to tighten tiny screws to handle. Is easy to sharpen and looks good. Would not put my life on the line with it. My fingers are numb but I can open most knives. I couldn't open this one. I would have sent it back but it wasn't worth the effort to me. This knife is great for the price. It looks really nice (one of the handle pieces that was supposed to be black could have been darker and more evenly colored, but no biggy). It feels sturdy and the knife spur opens it right up. I have several knives, but none can match the stiletto I bought from you several weeks ago. The blade is super sharp, it is easy to open, and makes a great defensive weapon as well as a fantastic pocket knife. The knife is exactly what I have been looking for. It opens quickly and it is very impressive.